Infographic: Terms to use when ordering at Starbucks. Before I started working at Starbucks I didn’t know much about espresso. Sure, I liked coffee and tea, but I couldn’t have told you the difference between a cappuccino and a macchiato. 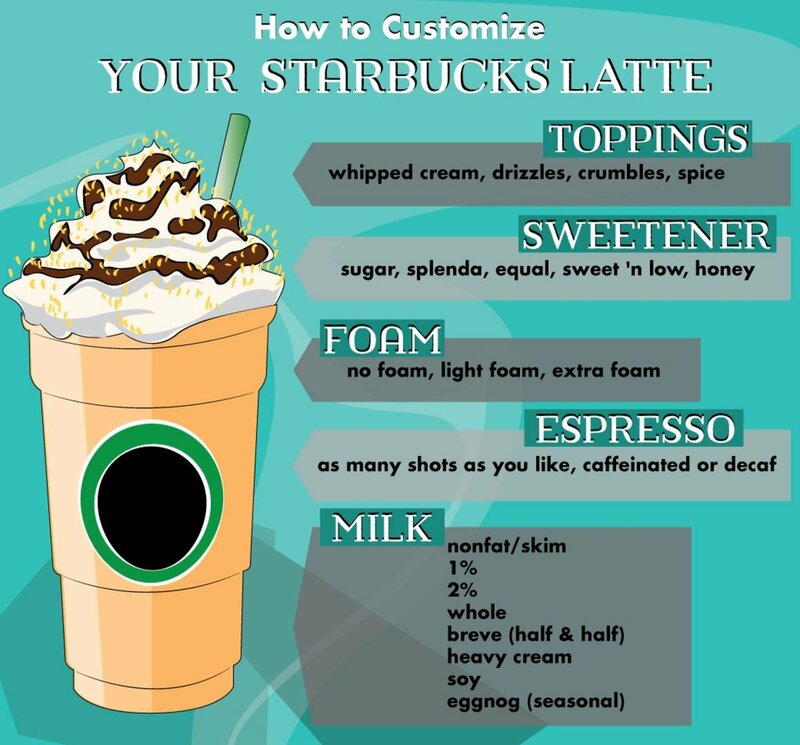 A lot of Starbucks customers are unfamiliar with espresso drinks and could benefit from some information about our menus. There is also some unique lingo at Starbucks. Read on so you can sound like a pro when you order your next drink! What is a Shot of Espresso? What Is a “Skinny” Drink? 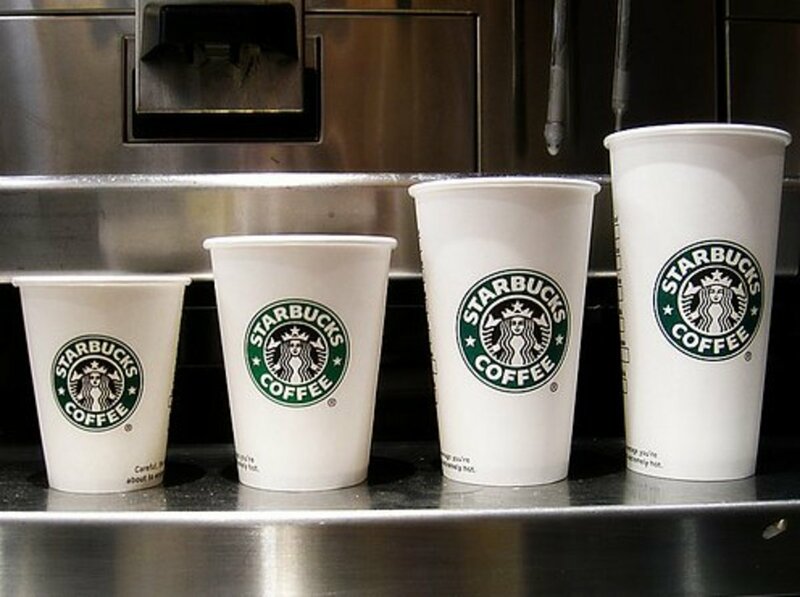 A number of drinks on the Starbucks menu are made with espresso shots. A shot is about 75mg of caffeine. You may hear the term "pulling a shot" thrown around. 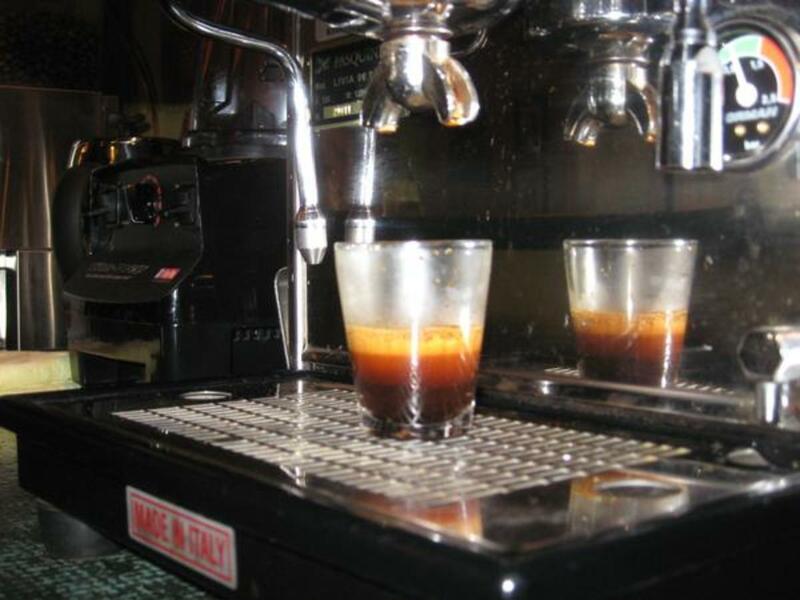 Pulling is a barista's way of referring to how the espresso is brewed by the machines. Starbucks stores use automatic espresso bars. This means that the machine grinds and prepares our shots for us. Traditional cafes may do this by hand. We still retain some control of the quality of the shot, however, as we must maintain and adjust our machines throughout the day. The amount of caffeine in any coffee-based drink is known to fluctuate, but 75mg per shot is the best estimate. If you are worried about your caffeine consumption for health reasons, I would urge you to overestimate and assume there is anywhere from 80mg - 100mg of caffeine per shot of espresso. Comparatively, an average 8oz drip cup of coffee contains around 104-192mg of caffeine, according to the American Beverage Association. What size will you get if you ask for a "regular" at Starbucks? If I am your barista, I will ask you to be more specific. You can always ask for small, medium, large, and even extra large (for iced teas, refreshers and iced coffees), but here are Starbucks’ special terms for sizes. The smallest size Starbucks offers, a short drink is 8 oz. Only hot drinks are available in this size cup. You'll have to ask for this size specially, as it's not even listed on the menu. Served in the same size cup that is used for shots of espresso, this is also the default size for kids' drinks. Tall drinks are 12 oz. You'll get this size if you ask for a "small". Grande hot and iced drinks both contain 16 oz. This is the only size available for smoothies. This is the size you get if you order a "medium". Venti hot drinks are 20 oz. Venti iced drinks are 24 oz. The size you get if you order a "large". The Trenta size is only available for iced teas, refreshers, and iced coffee and the cup holds about 30 oz. Kids' Drinks Your barista will prepare the drink to 130 degrees Fahrenheit, which is still warm but definitely immediately drinkable. Extra Hot This special request is 180 degrees Fahrenheit and it is nice if you have a long way to take a drink. It will still be warm once you get where you're going. Coffee and Hot Tea These drinks are both made from water that is 200 degrees Fahrenheit. I hope that's plenty warm for you! Starbucks offers nonfat/skim, 1%, 2%, whole and soy milk. Half and half, also referred to as breve (BREH-vay), heavy whipping cream, and vanilla soy milk. 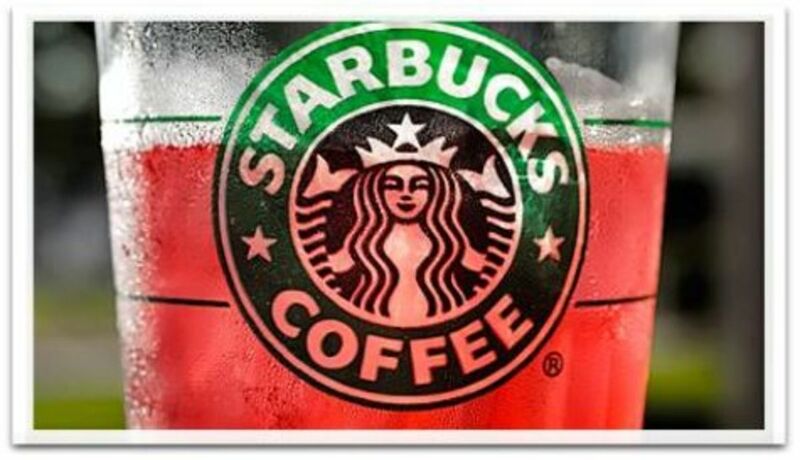 Most Starbucks drinks are made with 2% low-fat milk, unless you ask for something else. One big exception is the frappuccino—those delicious, iced, blended drinks—which are made with whole milk unless another choice is specified. Another exception is the new Flat White, which is also made with whole milk. 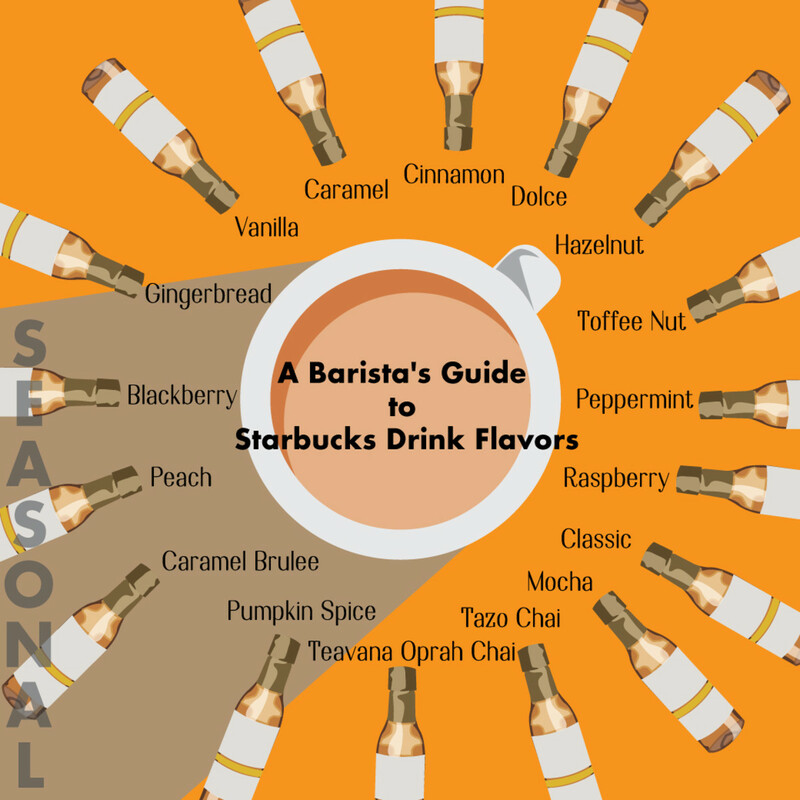 Infographic: Flavored syrups available at Starbucks. Pumpkin Spice Usually available from October until January or February. Caramel Brulee This syrup has become a Starbucks holiday season staple. It's usually available from November to Jan/Feb, as stock runs out. Gingerbread A winter seasonal syrup, usually available from November through Jan/Feb. Sugar-Free Peppermint Another winter seasonal syrup, this is used in the Skinny version of the Peppermint Mocha, but you can request it on its own. Peach A summer-time seasonal syrup that is most commonly used in the featured Peach Green Tea and Peach Green Tea Lemonade. Blackberry A newcomer for summer 2014, this was featured in the Blackberry Mojito Tea and Blackberry Mojito Tea Lemonade. 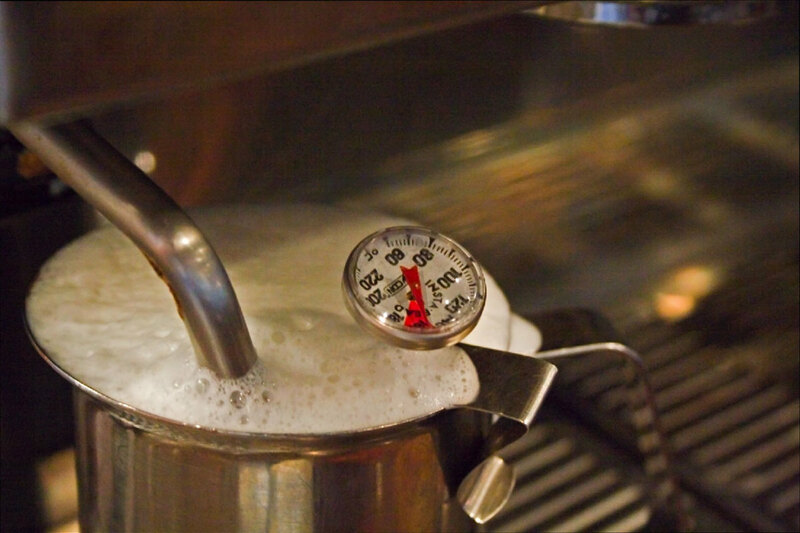 All of the syrups used at Starbucks are measured with pumps for consistency's sake. One pump of a normal syrup comes out to one-quarter of an ounce. Chai, Mocha, and White Mocha pumps are about a half of an ounce. The amount of syrup in a drink can be changed to suit your taste. It's not at all uncommon for a barista to be asked to put half as much syrup in a drink. Baristas are perfectly capable of executing a half-pump. I've even served a few drinks with a quarter-pump of syrup. These are the amounts of syrup your barista will use in your drink, unless you request another amount. What Is a "Skinny" Drink? A skinny drink has nonfat/skim milk and sugar-free syrup. Skinny drinks will not be topped with whipped cream unless requested. The term "skinny" usually refers to a latte, but if you ask a barista to make any drink skinny, they'll know what you're talking about. 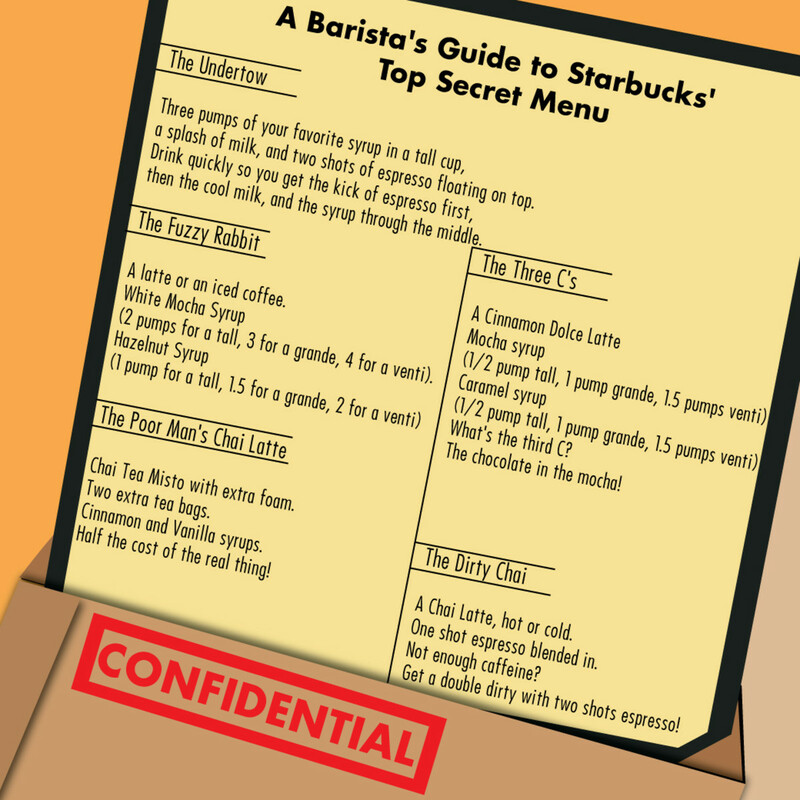 Infographic: Starbucks' "secret menu" of drinks. Thanks for reading! I hope you found this information helpful. 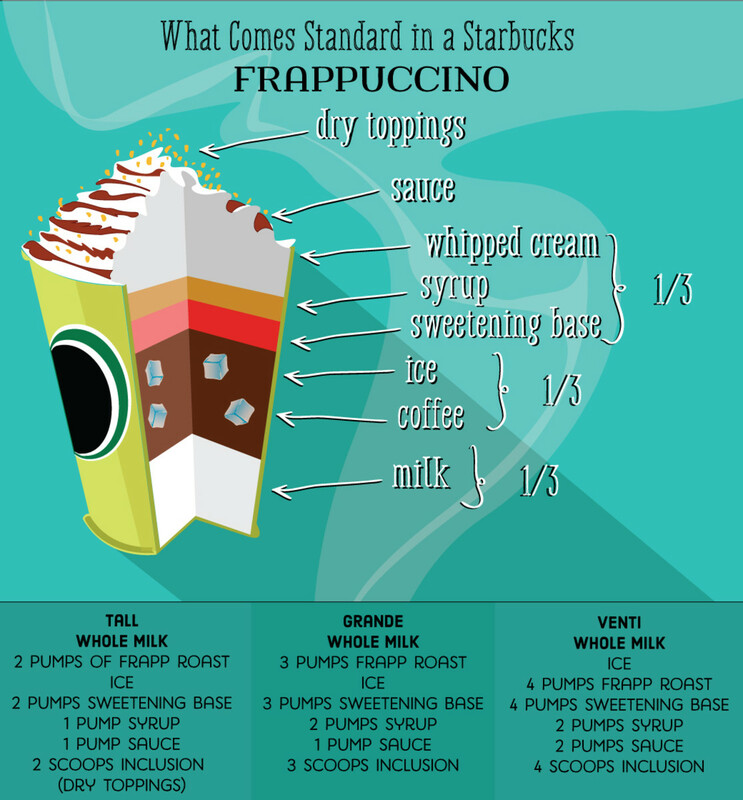 To learn more about the Starbucks menu, continue on to the next part of my guide which addresses Lattes. 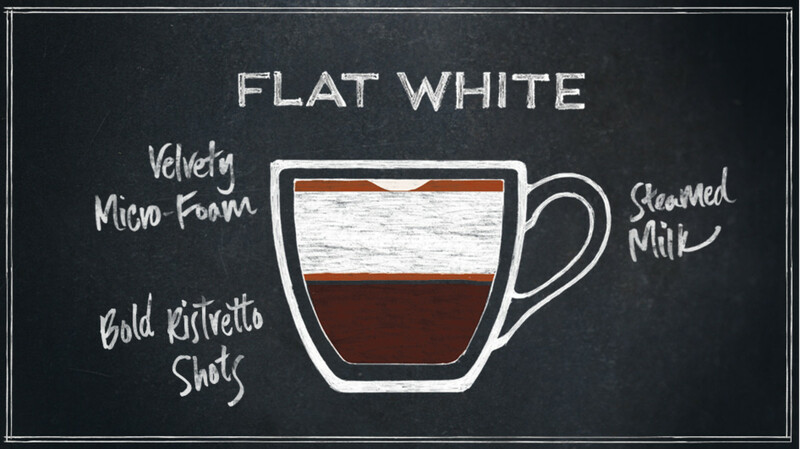 Check out my latest installment to learn about our newest menu item, the Flat White! How many shots go in Starbucks iced drinks? For most iced drinks, a tall and a grande both get two shots of espresso, and a venti gets three. I’d like to order a chai tea from Starbucks, but they are too sweet. How can I ask for a chai diluted with milk by half? Keep in mind that the chai used in Starbucks is a liquid measured in pumps. If you were ordering a grande, ask for two pumps instead of the usual four. The space would be automatically filled up with milk. So, order a Grande Chai with 2 pumps. If I want a chai tea diluted by half or 3/4, what do I ask for? A chai tea latte is made with pumps of syrup. The usual amount of pumps are 3-4-5; so three in a tall, four in a grande, and five in the venti. To get a less strong chai, just ask for fewer pumps. I am a barista and this helped a lot!! thanks! Does "No Classic" mean sugar free? I'm sure you probably don't monitor this blog but if you do, what is the shot to water ratio for unspecified Starbucks Americano? If I walk in ask for a Tall, Grande, or Venti Americano how much espresso will be in each? You have 1000 times over, made life easier for my next coffee break at Starbucks. Thank you, very much. Pumpkin spice all the way lol.. Great read I'm following you :) follow back please. Thank you so much for doing this hub! I never understood the some of the terms before and I felt so weird when they said, "what size? Grande?" And I would say, "Uhhhhh..... small?" I finally know now! Thanks!!! 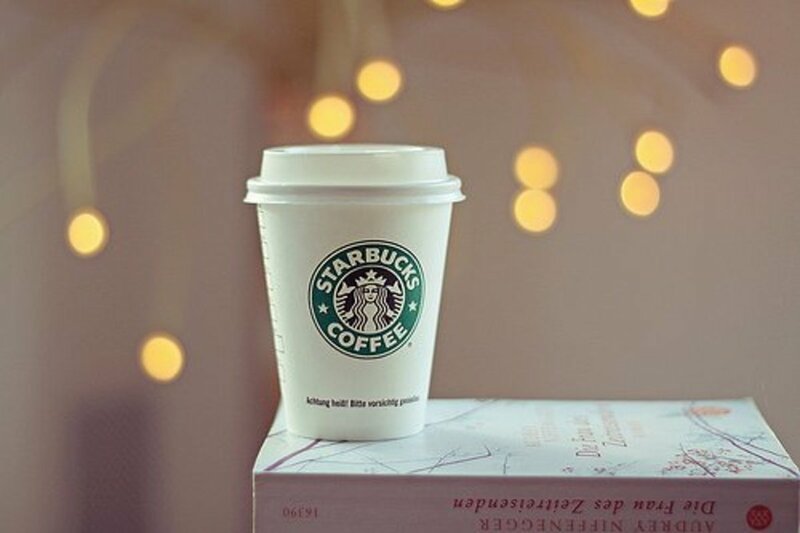 I am a Starbucks addict and I thought I pretty much knew everything there was to know. I was wrong! Great article. Thanks for sharing. I simply love Starbucks and when I go abroad (in my country there is no Starbucks, but there is a similar chain called Arnold Coffee, but only in two big cities) I always go to Starbucks. The first times I had some problems at ordering there, but now I know all delicious drinks they make, and I find this hub very useful for people who, like me once, will go to Starbucks for the first times! Wonderful information. I can feel less foolish when I purchase a coffee from Starbucks. I haven't been into Starbucks for a while but part of the reason for that is that ordering a simple cup of coffee is so damn confusing! I think I understand things it better now. Great Hub. Voted up. Seriously? Gimme a large double-double! Brooke - I wish I had a book to recommend! 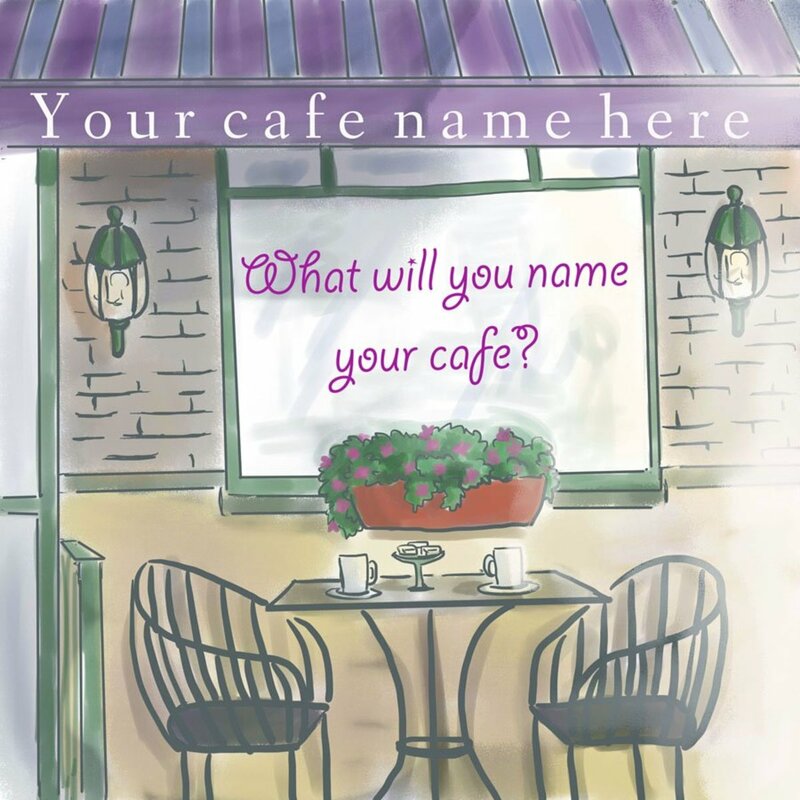 It might be interesting to browse 'copy cat' type recipes for popular coffee shop chains to get an idea of what kind of ingredients you can use. You rock! I am opening a small coffee shop in my small Texas town and I LOVED reading all your information! Can I fly you out to do a personal barista training...lol! Is there a good book that you would suggest for recipes? I work with a barista who started in a Barnes & Noble store. There was certainly an adjustment to be made, but I hope the staff at your store is as supportive as the staff at mine! I'm glad my hubs could help. Just want to say thank you soooooo much mandination, I am new to starbucks and this is an awesome complete guide on how to not look a stranger inside a starbucks cafe, you're even concern writing down the seasonal items and time of availability therefore I wont look dumb when looking for it at a particular time, the terms, the options and kinds to choose from, thank you! I just started my training as a Starbucks barista and have found myself very overwhelmed with everything, having not really been a cafe (Starbucks) goer since this last summer. I have basically no knowledge of Starbucks drinks. At least not yet. This will be great for me to review at home when I can. Thank you! I've worked in a Barnes & Noble cafe for the past two years in SC and in MA and will soon be starting a new job at Starbucks. I was very excited to find your site to brush up on the way Starbucks makes their drinks as opposed to B&N. B&N does not follow the standards of Starbucks. They sometimes change the way a drink is made and the way cups are marked. This means you cannot work for one B&N and transfer to another without having to learn a completely new way of cup marking and drink making. Thanks again for posting this site. I don't want to look like a complete fool when I start and even though I know the basics and how to make all of the drinks I wanted to make sure before I start that my information is correct. This has helped a lot. I remember speculating about how much milk exactly is in a Frappuccino, and what I'm thinking is that I must have said that in a comment. The lines on the cups are what we use for measurement, so I've never tried any other method of measuring the milk - but, the milk plus the coffee fills up the first line on the cups. There isn't a ton of milk in these, especially when comparing to an iced latte, which gets milk plus syrup plus coffee up to the top line on the cups. Considering a Grande cup holds 16 oz, I'll stand by my 4-5 ounce estimate. There's something like two ounces of coffee, so I would guess the first line on the cup is somewhere between 4-6 ounces, making the milk content 3 ounces at the very least. "How much milk is in the Grande Frappuccino?" I asked for one... I wanted to know (I already knew how many pumps and how much base... Ice eh I did not figure too much or too little ice was effecting the taste that much.) and reason two... I can not stand when it is not made right and I have a rude employee snidly say "well what is wrong with it?...." I don't know, I did not make it, I do not know no much of what goes in it. Long story short. I googled the question and your page came up. THRILLED. It showed the google preview as "if I had to guess a grande would have 4-5oz. of milk" But now I can't find that listed anywhere on here. Am I missing it? Thanks for the info. I was looking for the number of pumps to make my own at work on the days that I don't stop at Starbucks. I love how you relate the names of the sizes, and the reason that you used to only order the Tall. I'm right there with ya! Awesome! I consider myself to be a huge fan of Starbucks coffee and pride myself of having quite a bit of knowledge about their menu - especially when I go there with a friend who doesn't understand the menu at all - and even still, this hub has taught me a lot about Starbucks! Thanks for the info, and next time I go, I'll be ordering a Trenta! I'm a Starbucks junkie, too (but for the tea). Great job sorting it all out for the newbies in our midst. Cheers! I didn't even know there was something called a Trenta. I am glad I found this hub! P.S. 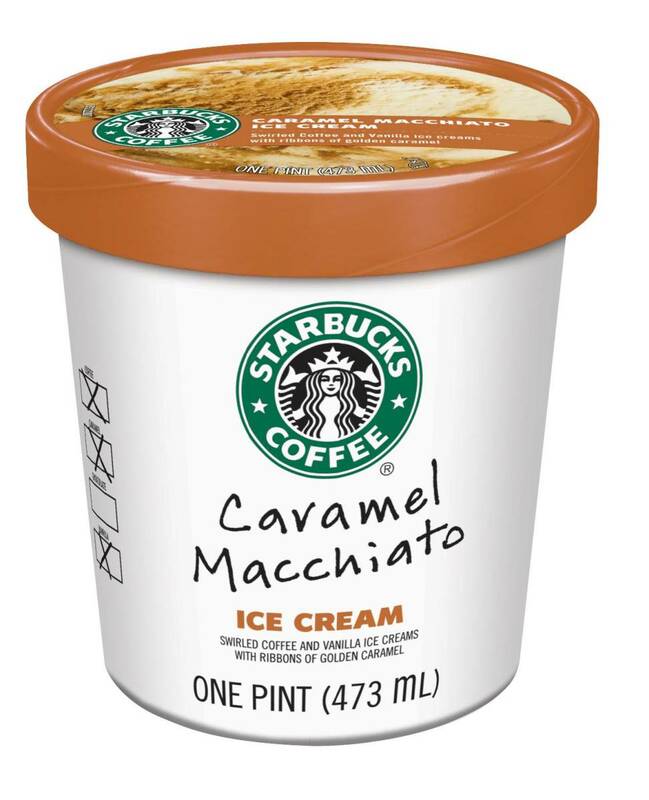 I love the caramel flan flavor! I hope it never goes away. I seem to spend a fair amount of time at Starbucks and didn't know there was a "short". Good information! I rarely go to Starbucks but, when I do I feel this anxiety like I am not going to order properly. Thank you for the Starbucks 101. It is very helpful. I voted your hub up and awesome. My Mocha Valencia lives on in my home. 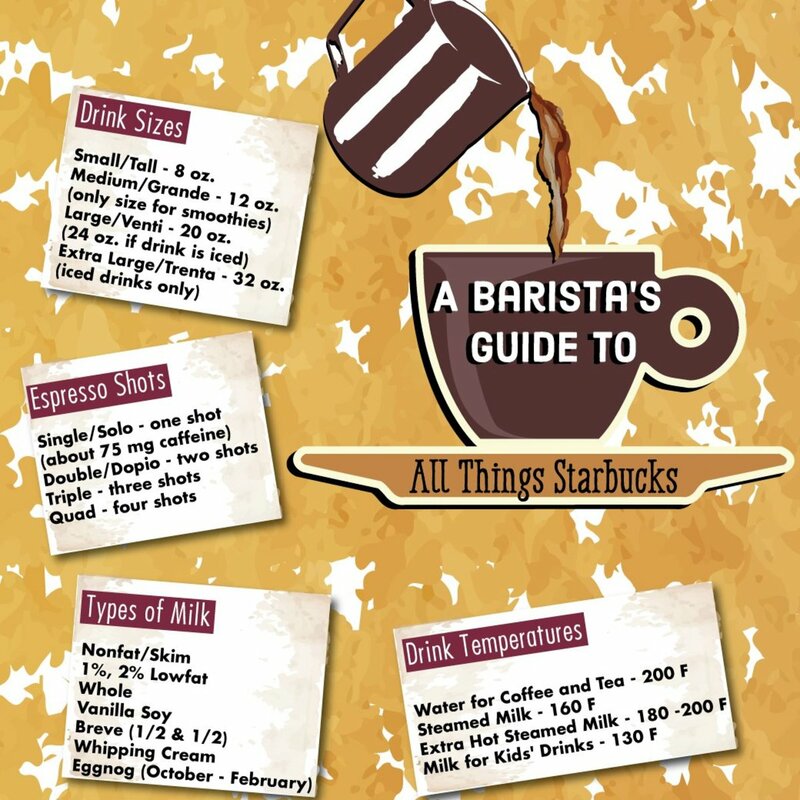 This is very useful because this will be the 2nd week of training as a barista in Starbucks. All the info given helps me review and help me understand some of the drinks. That would be wonderful, and if you find out how it was made, I'll be forever indebted to you! I just now noticed that you are in Pittsburgh. I must be the only Clevelander that really loves Pittsburgh! I love your site. It really clears things up, presenting the information in a very clear and simple manner. I'll always refer back to it. Is there any chance that you or some of your co-workers that may have been around longer than you, know how to make the old Mocha Valencia? I believe that it may have been officially called: "White Chocolate Mocha Valencia". I come from a country where Starbucks is unheard of. 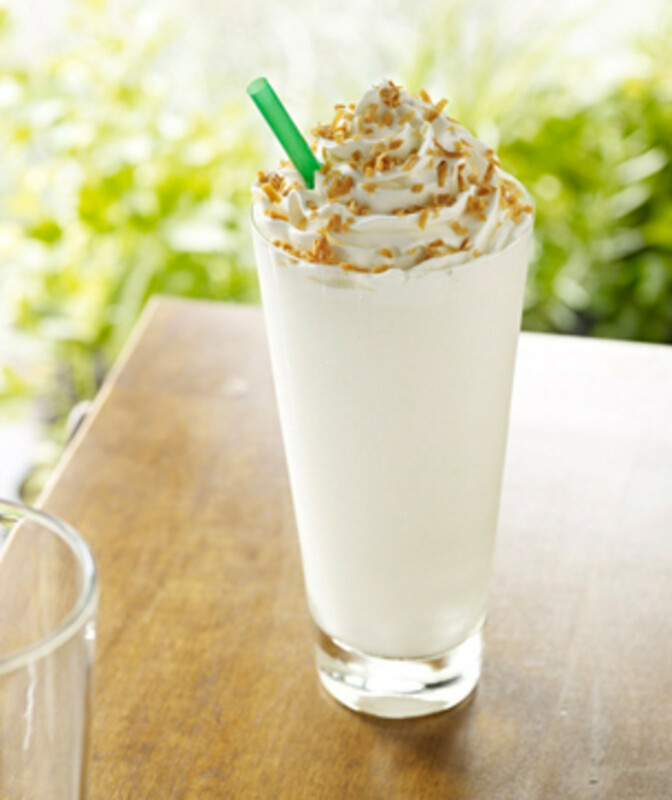 Today when I went to Starbucks for the first time to get some nice hot drink and ordered a caramel frappucchino (and undoubtedly thought it was a hot beverage :P), I felt really helpless. Thanks a lot this info...I really did not know we can customize the drink so much and that there are lots of options available. I wish I would have read this before my first visit to Starbucks!! This should be required reading while waiting in line to place your order. Being a barista, I obviously get my Starbucks coffee from my store, but I do have friends that buy their coffee elsewhere. I do believe you can buy it whole bean and either grind it in store (most grocery stores tend to have grinders in the coffee aisle,) or you can absolutely take it to a Starbucks to have it ground. Unfortunately, I don't think pre-ground coffee will be available for a French Press, because it's just not as common of a brewing method. I just want to say thank you for this post! I just started working at Starbucks (today will be my third day!) and I forgot how many shots of espresso the different sizes of drinks got. The pumps are pretty easy to remember, 2-7 with one extra for each drink, but I got mixed up with the grende and venti shots, one person said the Venti gets 3, another said 2 and iced gets three, another person said they do three all the time for Venti. Glad I have the proper amount now! Thank you. WOW. Thanks for the comprehensive guide! Also, as a barista, do you know if the Starbucks ground coffee sold in Target, Amazon, Walmart etc are ready for French Press brewing method? Or do I have to drop by a store and have the baristas grind them coarsely on the spot for me? Thanks again. I never knew they had kid's temperature as an option. That's great information! Now I can stop by Starbucks and worry less about the kids and their spills. Thanks! Thank you for creating these Strabucks guides!! I recently (last week) started working in a very busy location. These guides are so helpful! I've been pretty overwhelmed with the amount of information regarding measurements and recipes. The guides are definitely allowing the info to soak in =). Thank you! Love Starbucks!!! Try an upside down triple venti Carmel macchiato w 3 pumps chai, 2 pumps vanilla extra foam....yummy!! I'm loving all your Starbucks posts! They are sooo informative! I'd love to see one on the Carmel Macchiato next please?! More helpful Starbucks information, thanks! Hey, this was vey helpful! I kept wondering what the hell was Venti! Loll, I was so confused. I always wanted to know why was Starbucks so much better than Dunkin, and now I am aware! Thanks!! ???? I found this really useful to know what I'm getting. I'm afraid I always ask for small, medium or large, on principle! Then I'm clear what I'm getting. Thanks for the info. I rarely go into Starbucks, but when I do I always feel like a fool because I don't know what these drinks are and I'm embarassed to ask. Thanks for sharing your Starbucks 101 hub!